Historically, liver surgery was associated with high morbidity and mortality rates. However, over the last 20 years, we have adapted our intraoperative technique and surgical approach to drastically decrease these rates. One of the primary reasons for this improvement is known as hepatic parenchymal preservation, a surgical technique that allows the surgeon to spare as much of the liver as possible. The traditional and most common surgical method of treatment for liver cancer was a major hepatectomy in which a lobe (hemi-liver) is removed in order to remove the tumor. These major liver resections were associated with high blood loss and liver dysfunction. Today, the majority of patients with metastatic colorectal cancer are never sent to a liver surgeon because of the persistent impression that a liver operation is too dangerous and patient outcomes are poor. 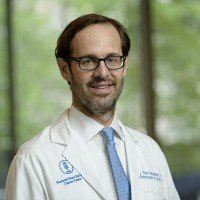 But in actuality, advances in surgical and anesthetic techniques and operating room devices, as well as improvements in perioperative patient care, have made liver operations safer and more effective over the last 20 years. We have found that when a patient has a single tumor, or tumors confined to one side of the liver, a surgical approach called hepatic parenchymal preservation is far better than the traditional approach of removing large sections of the liver. This preservation procedure involves removing less than a lobe of the liver without compromising principles of cancer surgery. Figure: The CT scan shows a tumor in the posterior section of the liver. The yellow line depicts the amount of liver that would be removed with a right hepatectomy. The orange line depicts the amount of liver remove with a parenchymal preserving posterior section resection. It places less physical stress on the patient and allows a quicker recovery time and the option to undergo a subsequent operation, should the cancer recur. In our recent study, we analyzed hospital records of all patients who underwent liver resection for a malignant diagnosis from 1993 to 2012 at MSK. (1) There were 3,875 patients who underwent 4,152 resections for cancer entered into our database. The most common diagnosis was metastatic colorectal cancer. We divided the patients into three similar-sized groups according to time period: early (1993 to 1999); middle (2000 to 2006); and late (2007 to 2012).We then looked at the percentages of major and minor hepatectomies within each era (major resection was defined as removal of three or more segments of the liver) and compared outcomes in surgical morbidity and mortality rates between the three time periods. postoperative liver dysfunction for all cases decreased from 3 percent to 1 percent. We have demonstrated that it is possible to do safe hepatic resections. Although it may be technically easier to remove more of the liver in some cases, we think that patients should be considered for hepatic parenchymal-preserving surgery because there is a real difference in mortality rates. This experience is why it is important for patients to be treated at a high-volume center such as MSK. Kingham TP, Correa-Gallego C, D’Angelica MI, et al. Hepatic parenchymal preservation surgery: decreasing morbidity and mortality rates in 4,152 resections for malignancy. J Am Coll Surg 2015; 220(4):471-479.